Driving home very late Tuesday night from the airport it happened again - the same thing that happened the last two times I came back home from a trip - you got it - snow! Flakes were swirling in the air on the drive home, and I woke up to an inch on the ground, and little flakes blowing in through the open window and landing on my face as I slept. I was all kinds of excited, while the locals think I should be shot. "Enough already!" they say - of me and the snow. Cindy Bradley, who's here from sunny Arizona with her husband Steve and two horses for the Tough Sucker ride on Saturday, said, "You're just all kinds of happy aren't you?" after she saw me do a snow dance. 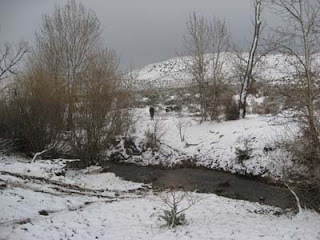 During the day, the wind peeled away the layer of snow in Pickett Creek Canyon to reveal a green carpet of grass (and weeds), framed by the bright white Owyhee mountains in the southwest. It's been so long since I've been on a horse I was afraid I might have forgotten my balance or something, but today I had an awesome ride on Rushcreek Mac (he's done GREAT with John down south this winter), and followed that up with a great ride on Rhett. 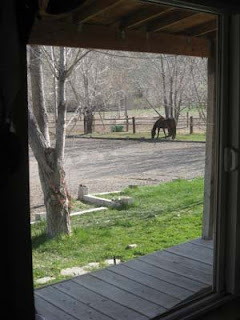 Now, I'm watching my horse out the window, mowing the lawn grass. 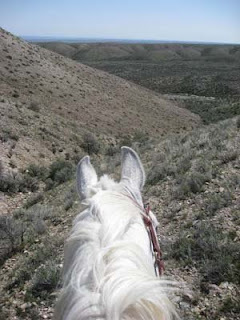 The catch-up work never stops - there will be stories and photos from the Owyhee Tough Sucker endurance ride here this weekend, I have pages of emails to wade through, I still have many Al Andalus stories and pictures to catch up on, and there's the next ride to get ready for here in May (the 3-day Owyhee Canyonlands), which means more horses to condition for that. Oh, it's good to be home again.